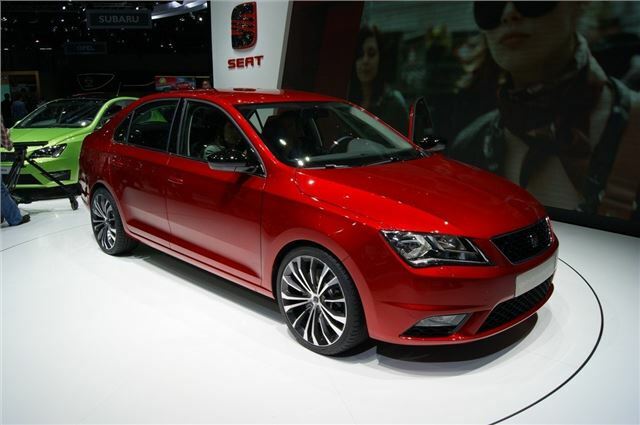 SEAT has officially unveiled the new Toledo at the Geneva Motor Show. It returns to a more conventional saloon shape, following the MPV look of the previous generation model which went off sale in 2009. The mid-sized Toledo is around 4.5 metres long - which is similar in size to a Skoda Octavia - but SEAT is obviously aware that in the UK smaller saloons aren't very popular. So instead of a conventional boot, the new model has a hatchback style tailgate, like the original Toledo. This means it should be practical and, with a 500-litre boot, it can carry far more than a Ford Focus or Vauxhall Astra. The rear seats fold down too for even more space. The car unveiled at Geneva is officially a concept but the new Toledo will go on sale by the end of 2012 and will look pretty much identical to the pictures above. The interior follows on from the latest SEAT models, with a similar look plus features such as the extensive use of piano black finish giving it a more upmarket feel. The exterior styling is far more angular than current SEAT models and you can expect to see a similar look on the new Leon - which is due in 2013. SEAT is also planning to launch a new crossover, based on the same platform as the Audi Q3, although nothing concrete has been confirmed. As well as being practical, SEAT is also promising that the Toledo will be good value for money with decent standard equipment levels. The engine line-up will include the familiar TDI diesels and TSI petrols with Ecomotive models offering low CO2 emissions and fuel consumption.